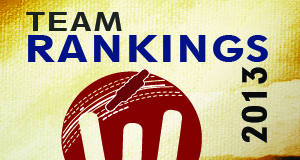 The 8th Edition of my Cricket player rankings are out! And you won’t be able to easily guess who is the Most Valuable Player!! A Total of 338 players took the field in 2013 as against 286 in 2012 (this number is getting smaller every year for the last few years). Even though South Africa had a bad win loss record they had the best set of players and were ranked as No 1. Although they won just 14 out of their 29 matches, they beat Austrailia to the No 1 spot. Australia came second and India came third. They were followed by Sri Lanka, Pakistan and New Zealand. Kevin O Brien of Ireland took the top spot. Well something to watch out for during the World Cup! Kevin smashed just 1 half-century on the way compiling 184 runs in 7 matches at an average of 36.8 and a strike rate of 118.7!! He took 13 wickets at an average of 18.23 and economy rate of 4.93. He also took 5 catches to be way ahead of Hafeez (Pak). George Bailey for once stepped out and got cracking. He got the No 1 spot with 1098 runs from just 16 matches with a high average of 64.58 and a strike rate of 100. He smashed 2 centuries and 8 half-centuries on the way to achieving this. Sangkara (SL) smashed 2 centuries and 10 half-centuries on the way compiling 1201 runs in 25 matches at an astounding average of 63.21 and a strike rate of 89.56!! Pakistan had the best bowling attack this year with 4 in Top 14. India was next best with 3 in Top 11. Dale Steyn (SA) found himself at the very top spot! He took 27 wickets in just 13 matches at an average of 15.85 and an astounding rate of 3.65 rpo! For the first time there was a tough fight between 2 brothers for the top spot! Umar Akmal pipped Kamran Akmal by decimal points to take the top spot. Both of them were missing from the Top 30 list last year. 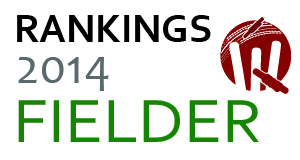 Whereas last year’s Top Kieswetter (Eng) goes missing from this year’s list. Umar Akmal (Pak) took 26 catches and 9 stumpings in just 19 matches to take the top spot. *These rankings are based on Players who played 5 matches or more. These rankings are prepared solely by myself based on owned algorithms. 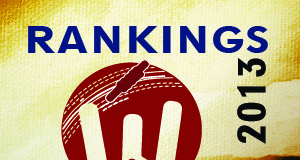 These have no relation with ICC or any other rankings calculated elsewhere in the world.